BIO-DIGEST | Pro Chem, Inc.
Utilizing the latest technology in the bacillus industry, BIO-DIGEST provides a revolutionary approach to grease and waste elimination. This formula combines 7 strains of bacteria that consumes FOG (fats, oils and greases) in any plumbing system. With every dose, billions of living bacteria wake up and feed on dead organic waste. 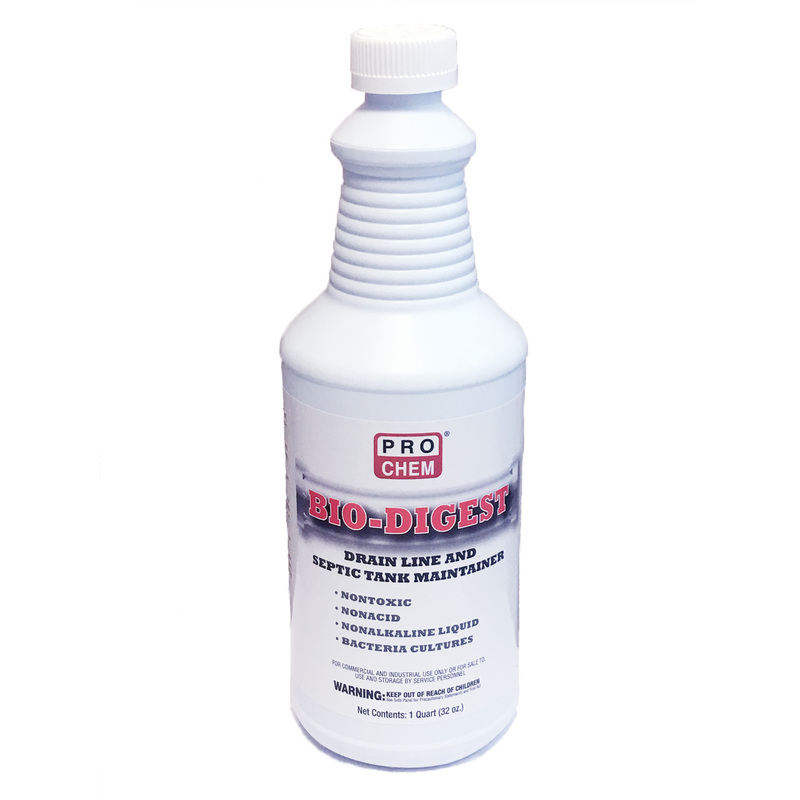 BIO-DIGEST is resistant to bleach, quaternary disinfectants and alkaline cleaners that normally inhibit the performance of most bacillus products. Ideal for use in healthcare facilities, this environmentally friendly, nonflammable product not only meets the necessary safety requirements, it is also resistant to antibiotics and chemo, which are more prominent in these environments. The bacterial colony will double in count every 20 minutes, leaving a biofilm coating in every inch of the plumbing system. Regular use of this product creates free flowing drains, eliminates foul odors, destroys drain fly colonies, restores drain fields and reduces grease trap pumping. DRAIN PIPES: Pour 4 oz. of product in drain. Let stand overnight. Repeat every 30 days. If drain has not improved, check for obstructions. TO TREAT SLOW DRAINS: Pour 4 oz. of product in drain, shower, lavatory, kitchen sink or commode once each month. Double this amount if on a septic tank. SEPTIC TANKS: Add 1 full bottle for initial treatment. Thereafter use 1 capful in kitchen line & shower line every 30 days. LIFT STATIONS: Treat directly as the well fills and add at least 3-5 gallons per million gallons of flow capacity. Repeat with one gallon per week as a preventative maintenance program to maintain an odor free system. PORTABLE TOILETS: Add 1 gallon directly to toilet and cover solids with water to aid digestion. Repeat every time toilet is pumped. GREASE TRAPS: Use 8-40 oz of product daily depending on the size of the grease trap, type of cooking, cleaning procedures and volume. Used properly, this product will drastically reduce costly pumping charges and BOD wastewater surcharges. COMMERCIAL DRIP: Set 5-gallon pail pump to inject 14 oz per day. Treat side drains with 1 capful (4 oz). Replace pail and repeat side drain service every six weeks.